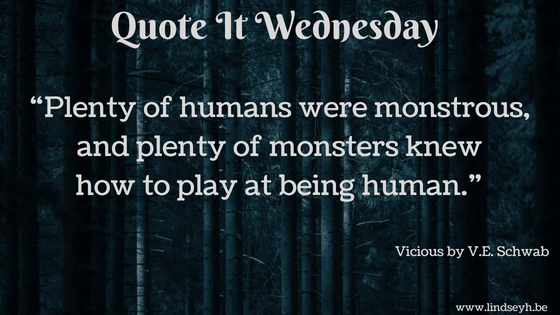 Today’s quote is from the book I am currently reading, which is Vicious by V.E. Schwab. Vicious is a great tale about superpowers, heroes and villains, but mostly about how the difference between the two isn’t always that big or even obvious. I’m really loving it, so I decided to feature it in this week’s post. What do you think about the quote? Are you already in that halloween mood? This is a great quote, and I’m SO ready for Halloween. It’s my favorite holiday. I still have Vicious to read, but I’m hoping to start it soon since the sequel is fast approaching. I like this! It definitely shows are things (and people ) are never black-and-white and not quite what they seem.